Lovely modelling, but your folder trees are 'gappy'. And why, why name multiple models' zips the same ? Never mind; this is another 'Classic', worth untangling. Thalek (2 years ago) Inappropriate? Uhm, where did you say the texture files were? I can't find them anywhere. Archeopterix (4 years ago) Inappropriate? Great suits. Yeah like Ricci said. Retro 60s astronauts. Ricci (8 years ago) Inappropriate? Yeah. . . .astronaut how it is supposed to be in the sisxties. . . .almost perfect. Thanks! Epithumia (8 years ago) Inappropriate? Thanks for this. It's very much what I need. I'm afraid I'm having a few problems with it, though. The textures folder is empty. 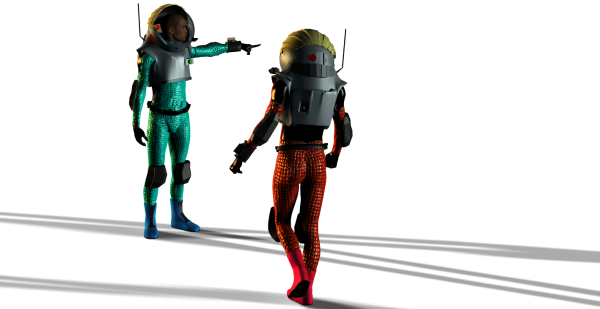 The texture files are asking for Bio suit body texture.psd, which I can't find. The file references are pointing to your L: drive. There are two copies of the .obj files - in Geometries and in Characters. Sorry if this sounds negative - I just more …Thanks for this. It's very much what I need.